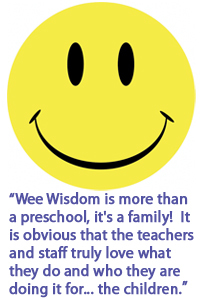 A Thank you note to Wee Wisdom Preschool Parents: Thank you for sharing your precious child with us the past months. It doesn't seem that long since we watched the butterflies emerge, rode Max, stirred our stew, shared a feast, gave our smiles, toured the museum, marched with flags, followed mysterious green footprints. Singing, acting, reading, a time for discovery EVERY DAY! WOW! A time they needed and continue to need to grow, develop at their own pace. Most importantly, a time to build that strong foundation that will serve them well in the future.